You may specify files and folders, and registry keys or key values that will be wiped and deleted through a single wipe and delete task on the Wipe Lists panel. Moreover, you may store such wipe lists to retrieve them and wipe later. 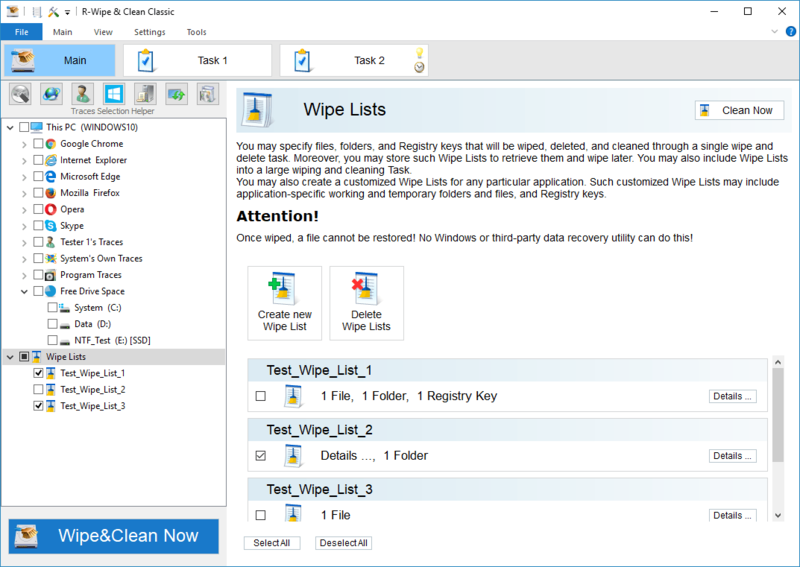 You may also include wipe lists into a large wipe and clean task. Go to the Setting a Large Wipe and Clean Task section for details. Some programs have their own temporary or scratch folders. It is wise to have them included in such wipe lists if you want to completely erase all temporary data from such programs. Attention! Once wiped, a file cannot be restored! No Windows or third-party data recovery utility can do this! 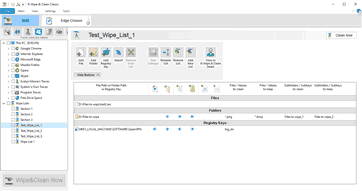 The contents of the selected wipe list will appear in the right pane. Registry key: The value will be cleaned but not removed. Registry key or folder: All child subkeys or subfolders will be cleaned recursively. Registry key or folder: All empty child subkeys or subfolders will be deleted. Registry key or folder: will be deleted if it becomes empty. • Click the Clean Now button on the right pane. 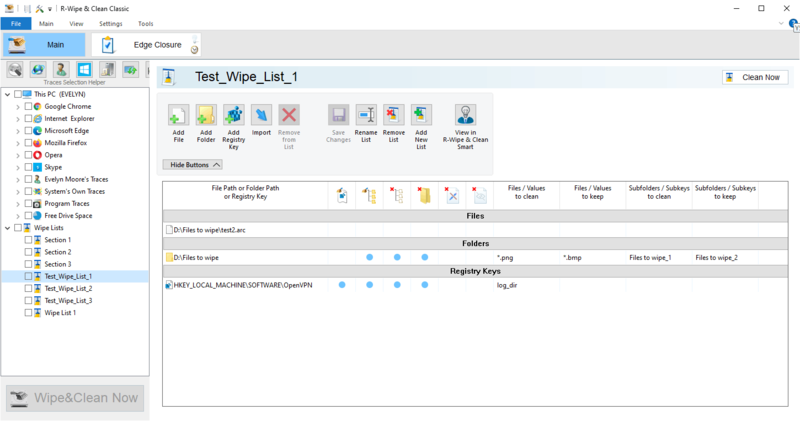 R-Wipe & Clean will start cleaning the contents of the wipe list. • Click the Clean Now button. R-Wipe & Clean will start wiping the wipe list. You may also manage wipe lists form the tab of a single wipe list using the wipe list management buttons. • Click the Create new Wipe List button. A new wipe list will appear in the right pane. • Click the Remove List button. R-Wipe & Clean will remove the wipe list. • Click the Save Changes button on the wipe list management buttons. • Click the Rename List button on the wipe list management buttons and enter a new name..
You may add a file or/and folder to the current wipe list directly from File Explorer. Right-click the file and select the Add to the Wipe List item from the shortcut menu. Make sure that the Add files and folders to a wipe list from the shortcut menu option is enabled on the Integration tab of the Settings panel. You may add a single file by dragging and dropping it to the Wipe List . You may add/remove files and folders to/from the list using the file management buttons. When you add a folder to the wipe list, the Add folder... dialog box will appear. You may set a file mask for files in the folder and specify files that are not to be cleaned if they even match the file masks. Specifies file mask to add files in the folder. If this box is checked, all sub-folders will also be cleaned. If this box is checked, the folders will be deleted when its content is cleaned. 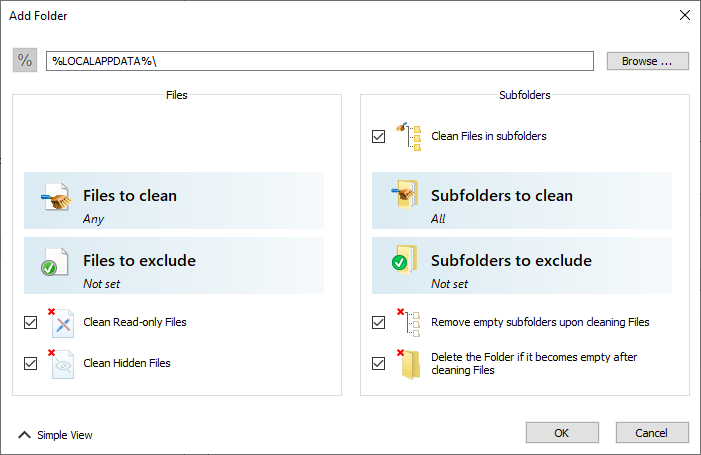 If this option is selected, the folder will be deleted if it becomes empty after cleaning files in it. You may also add a key or specific value in a key from Registry that will be deleted. 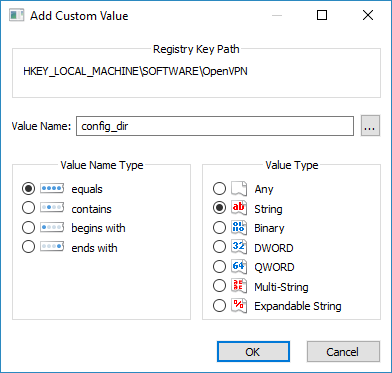 • Click the Add Registry Key button on the file management buttons and select the required Registry key or separate key value on the Add Registry Key dialog box to add them to the wipe list. You may add either all values in the selected key, or only specific values in it. The added Registry keys or values will appear in the wipe list. You may also add arbitrary custom values. Click the Add Custom Value button and specify the required values. 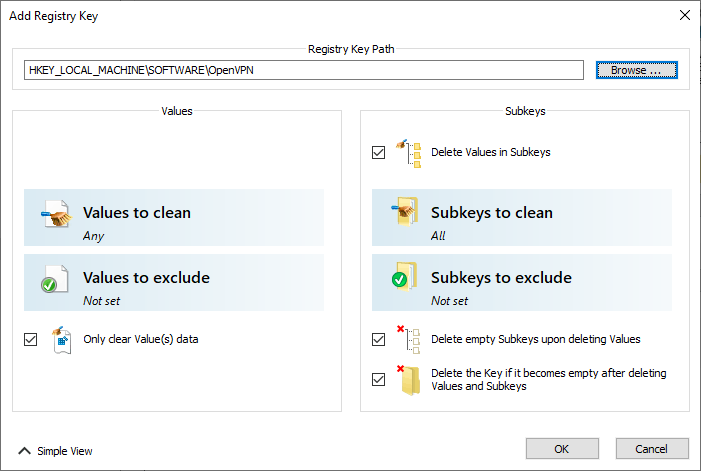 • Select a registry key or key values you want to remove and click the Remove from List button on the file management buttons. The selected registry key or key values will be removed from the list. Default file wiping settings may be specifically set on the Files Wiping Settings tab of the Settings panel.